A man was rushed to hospital with serious injuries yesterday after his Porsche sports car ‘crashed into a ditch’. Police are calling for witnesses after the incident just west of Steyning yesterday. A Sussex Police spokesman said ‘a Porsche Cayman sports car left the road and crashed into a ditch, leaving the driver with serious shoulder injuries’. 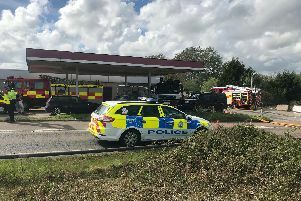 The incident happened in Washington Road at Buncton, near Steyning, about 600 metres east of the entrance to Wiston House. The road was closed until just after midnight. The car’s driver, a 43-year-old man from Harlow, Essex, was taken by ambulance to the Royal Sussex County Hospital, Brighton, for treatment. No other vehicle is thought to have been involved, police say. Anyone who saw what happened, or noticed the Porsche being driven shortly before the crash, is asked to email collision.appeal@sussex.pnn.police.uk, report details online here or phone 101, quoting serial 1443 of 16/07.